“All notions of freedom imply limits. When we say ‘my freedom stops where my neighbor’s begins,’ we are talking about individual limits. When we say “my country’s freedom stops where another country’s freedom begins,” we are talking about sovereign limits. I call freedom associated with space, and with peace or conflict, lateral freedom. But freedom or its lack can also be linked to the power of the few over the many, especially with respect to the latter's economic conditions, and this I call a lack of vertical freedom. These various concepts have been boiled down by the dominant culture to mean that if you live in a country whose leaders are chosen by elections open to all citizens, then you are ‘free’, and you live in a ‘democracy’. 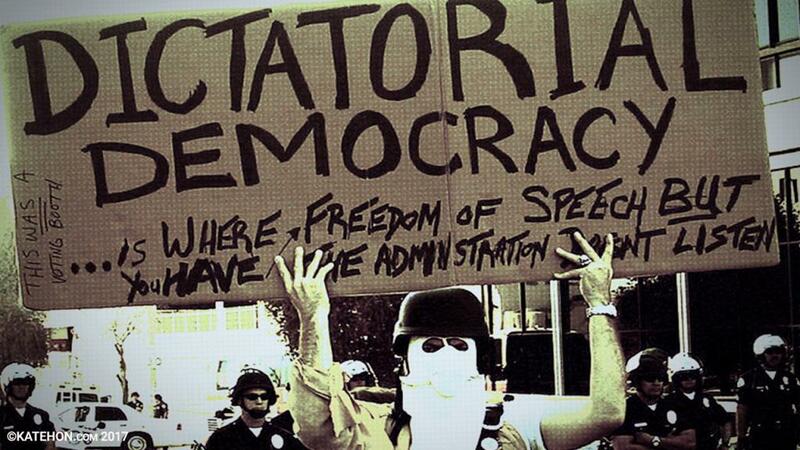 Reciprocally, only ‘democracy’ ensures personal ‘freedom’. But when the notion of democracy or ‘agency’ (social theory’s latest fetish), is embodied in an inked finger showing that a citizen has voted, there is no room for criticism of the way we are led. The Enlightenment’s ‘social compact’, according to which the only thing that matters is that individuals be ‘free’ to choose their leaders, does not ensure that they are well led. People who live in thatched huts with no running water do not clamor for ‘freedom’; they clamor for modernity, however the right to elect their leaders does not necessarily result in concrete buildings with running water. At the extreme, freedom means not being ruled by a ‘dictator’, who would assign a place of residence and a job, but beyond that, it is an empty promise. That is because, as nature’s limits show, there is no such thing as absolute ‘external’ freedom, humans being the only creatures to believe they can disregard this reality. The only limitless freedom individuals have is the one each of us carries within ourselves. No one can take away my freedom to think what I like, however both nature and society’s rules limit my freedom to transform my thoughts into acts. I can detest someone, but I do not have the right to harm that person. Freedom of belief is the most basic internal freedom, but it does not give believers the right to attack people of other faiths. Rather than a ‘clash of civilizations’, it is the confusion between freedom to think and freedom to act that is responsible for the strife the world is experiencing. In the West, notably, within the ‘rule of law’, ’freedom’ gives individuals the license to do anything, as long as it does not interfere with the freedom of others to do likewise - that lateral freedom discussed earlier. It follows that ‘people’ must be ‘free’ to achieve ‘democracy’, defined as ‘one man, one vote’. The problem is that when freedom is seen merely as a form of equality of opportunity (i.e., the right to vote), all sorts of acts are permitted that result in inequality of outcomes. The US Supreme Court has decreed that ‘money’ is the equivalent of free speech, and is thus protected by the First Amendment. This egregious interpretation of a founding American principle allows unlimited contributions to political campaigns to be used to persuade people of the opposite of what is objectively in their best interest, influencing the way they vote. The equality implied in the notion of reciprocity (each individual has the same rights as each other), is destroyed when an unequally shared possession (money) vitiates the only true freedom individuals possess, their thoughts and beliefs, determining the way they act. When an individual’s freedom to act has no limits other than another individual’s identical freedom, wealth can be used to support the vertical power of the former by modifying the latter’s internal beliefs and the votes they dictate. So much for ‘freedom’. But what about ‘democracy’? Taken from the Greek, it means ‘people power’, and was introduced as a reaction to the rule of ‘tyrants’, the Greek equivalent of our ‘dictators’. The ‘archos’, or head man, could not do whatever he wanted, but was kept in check by ‘the people’, through their representatives. (In ancient Greece, these were male property owners, not slaves or women…). The Enlightenment enthusiastically revived this notion after thousands of years of unchecked rule by Kings, and it sounded so good that it had a successful three hundred year run. Now that electronic technology has shown it to be largely a myth, the idea of reverting to the Greeks’ original idea of direct democracy is gaining ground, while those in power continue to claim that the ‘freedom’ of their constituents is unlimited and that it is guaranteed by ‘democracy’.